​Looking for a top rated coffee maker? Look no further! 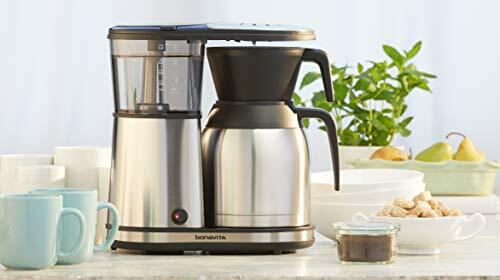 The Bonavita BV1900TS 8-cup carafe coffee brewer with stainless steel carafe can start your day off right with 40 ounces of rich, flavorful coffee! The compact design of this machine will look great on your countertop, and the stainless steel carafe will keep your coffee warm, omitting the need for a burner. The Bonavita BV1900TS is easy to operate and offers few customizations, but still brews a great cup of coffee. Aside from the power switch, your only brewing adjustment is whether or not to pre-infuse the grounds. Does the BV1900TS have a clock? No, there's no timer on this coffee pot. The only programming feature you need to worry about is the pre-infusion setting. This setting allows the grounds to steep for a bit longer before releasing the coffee into the carafe and results in a heartier flavor. Once you've set the pre-infusion switch to "on" this light will blink all through the brewing process. If the light remains solid, you are using the standard brew. Water is released into the filter basket in a wide shower drip array, resulting in fully wetted grounds and more consistent coffee. Whether you've turned on the pre-infusion setting or not, you can be assured of a consistent brew thanks to the broad shower head. While a permanent filter will fit in this filter basket, paper filters are recommended for best flavor. Because the BV1900TS brews directly into a thermal carafe, there is no burner and no risk of burned coffee. You never again have to wonder if you turned off the coffee pot! You may find it helpful to warm the carafe with hot water before brewing coffee into it. The Bonavita 1900 TS brews between 195 and 205 degrees Fahrenheit / 91 and 96 degrees Celsius. As previously stated, there is no burner under your carafe. Once the coffee brews, the machine turns itself off. The coffee maker will remember your setting choices regarding infusion. 1) Simplicity. Because there are a finite amount of brewing customizations available on the Bonavita 1900 coffee maker, there isn't much that can go wrong. If you like a stronger, more robust flavor, try out the pre-infusion setting. After that, drink up! 2) Carafe. While many coffee pots with burners have a timed auto shut off feature, this machine offers the peace of mind of having no burner at all. Horror stories of house fires caused by coffee pots that have boiled dry will no longer plague you once you've purchased this coffee maker! 3) Pre-infusion mode. A flat bottom coffee filter can result in uneven wetting of grounds and, occasionally, lackluster coffee. Once you turn on the pre-infusion mode of brewing, the coffee pot remembers and will brew a consistent, hearty cup of coffee each time. 4) Small footprint. This coffee pot offers a lot of brewing power in a small footprint and will easily fit under most upper cabinets. 1) Carafe. The thermal carafe is a source of frustration for some users as it doesn't maintain heat well, even pre-warmed. If you hope to brew 8 cups and enjoy hot coffee from first to last, you may be disappointed. 2) Lid. The screw-on lid must be in place before you pour, or the coffee pot will drip everywhere. This lid needs to stay off the pot while the coffee brews, which can lead to items cluttering up your counter. Also, to get the last of the coffee out of the pot, you need to hold it upside down and shake it, which is messy and can be hazardous. 3) Filter basket. The filter basket sits directly on top of the carafe to brew, so if you want the coffee to stay hot, you need to remove the filter as soon as the brewing is complete and screw the lid onto the pot right away. If early morning finds you less than dexterous, this can be a hot and drippy hassle. 4) No clock, so there's no timer. You can't program this machine to brew coffee you can wake up to. However, since you need to remove the filter basket and get the lid screwed on quickly to keep the coffee warm, this may be a plus. No Bonavita 1900 review would be complete without mentioning the need to de-scale this pot every 100 uses. For safety's sake, all coffee pots that use filter baskets should be descaled every 100 uses. In fact, doing this on a monthly basis is a very good idea. It will reduce deposit build-up and clear away any mold or bacterial build-up. Simply mix white vinegar and water 1 to 1, brew the mixture halfway, then turn off the machine for 30 minutes. Turn the coffee maker back on and finish brewing. Next, rinse all components and brew a pot of plain water to clear away the vinegar. To help prevent mineral build up in your coffee maker, see our guide on the best water filters. 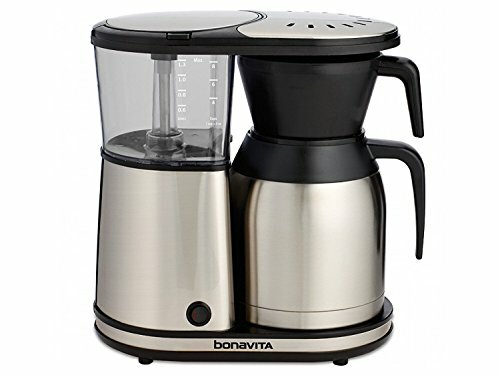 The Bonavita BV1900TS can make terrific coffee with very little fuss. The stainless steel carafe, if pre-warmed and properly sealed right after brewing, will keep your coffee warm as your day progresses. However, the filter construction does require some hands-on work before you can actually pour your coffee. If your day needs to start at a run, you may prefer a coffee maker with a hanging filter basket rather than this model.